One hundred and forty days later, the No. 6 Boston University men’s hockey team’s 2016-17 regular season will come to a close on Saturday night. The Terriers will host No. 13 University of Notre Dame for a weekend set at Agganis Arena, with the action getting underway Friday at 6 p.m. and wrapping up one day later at 7 p.m. Heading into the series, BU has a first-round bye in the Hockey East playoffs clinched, but can still capture the regular-season crown. For a full rundown of what’s set to unfold, check out Jonathan’s preview on The Daily Free Press. Aside from playoff implications, Saturday’s game will mark the last regular-season contest of Doyle Somerby, Nick Roberto and Tommy Kelley’s careers. They’ll have their Senior Night, capping four years of throwing on the scarlet and white. The trio means a lot to head coach David Quinn, too, because his first year at the helm was also their freshman season. To recount their time on Commonwealth Avenue, Jonathan caught up with Somerby, Roberto and Kelley to reflect. Click here for the full story on The Daily Free Press. The New Year often brings about new goals, a new perspective on the ebbs and flows of life. For the No. 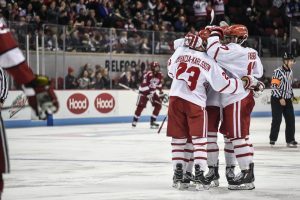 5 Boston University men’s hockey team, 2017 ushers in two things: the 2016-17 season’s second half and an unwavering outlook. That’s right – poke around Agganis Arena, the Terriers’ sanctuary, and the same laser-focused rhetoric arises. For David Quinn, who marshaled his team to a 10-5-2 record throughout the first semester, much of the same held true. Boy does time fly by. 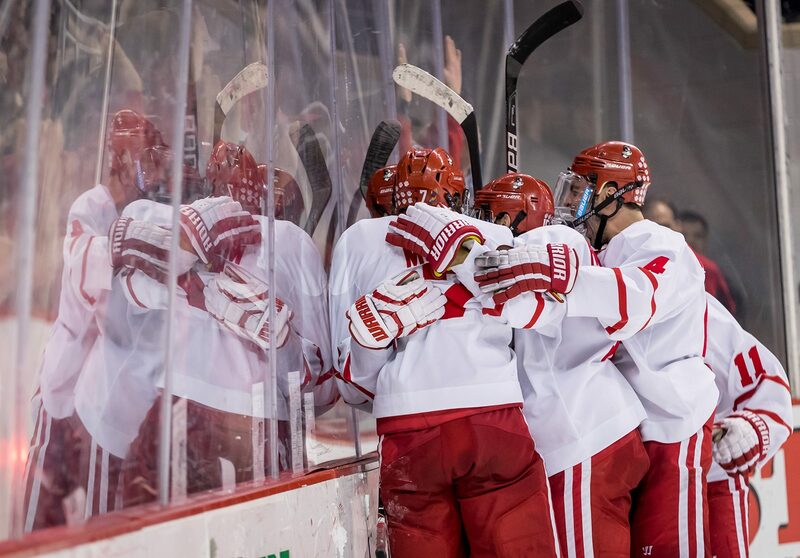 It feels like yesterday that the Boston University men’s hockey team got its 2016-17 season underway, but the halfway point is here. As things stand, BU is 10-5-2, sits fourth in the Pairwise rankings and sixth in the Hockey East standings. Of course, the state of the Terriers is not that simple, so we’re here to break down some of the subtler nuances and trends that developed in the fall of 2016. It’s also important to note context, as BU entered the year with great hype and expectations, largely the byproduct of rostering 11 NHL Draft picks. The jury is still out on whether all that talent will translate into silverware of some kind. Before we get underway, it’s important to give these two quotes from disparate parts of the semester a read through. The first came on Sept. 27 at Hockey East’s annual media day, and is from junior assistant captain Nikolas Olsson. Meanwhile, the second is from head coach David Quinn and came after BU’s 5-2 win over Yale on Dec. 13. 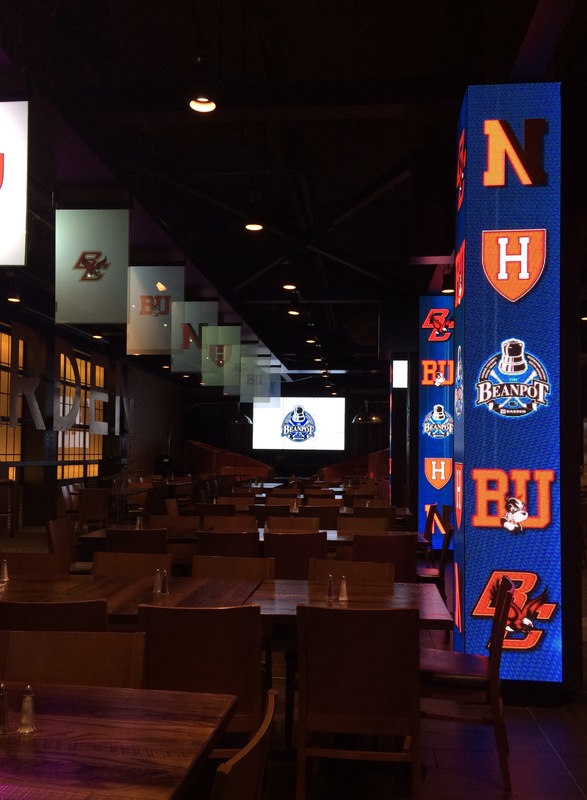 We pumped out some content this week for you loyal Boston University hockey fans. In case you missed it, here are links to the articles over on The Daily Free Press. Nick Roberto – What really happened to the forward last year? How did he and his teammates respond to the gambling probe? What’s his mindset like? 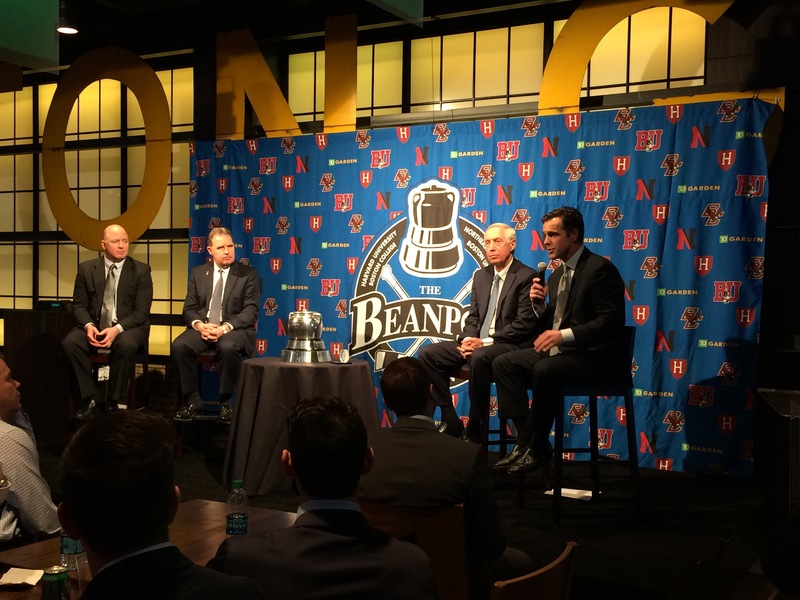 Jonathan Sigal sat down with the senior, coach Quinn and two teammates to find out. Patrick Harper – Let’s all stop kidding ourselves for one second: You didn’t expect this sort of production from the freshman forward. Neither did your friend, and it turns out Quinn didn’t either. Our Nick Frazier sat down with Harper to uncover what has led to his early-season success. Northeastern weekend – BU gets its Hockey East slate underway this weekend with a series against the Huskies from Northeastern University. Read on for several lineup updates, as well as how the Terriers have been preparing through their 12-day hiatus from NCAA play. 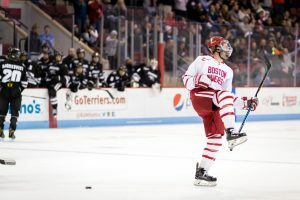 Junior forward Nick Roberto, who has not played a game for the Boston University men’s hockey team this season, has been suspended and will not play for the remainder of the season, sources confirmed to The Daily Free Press. Roberto has been out of the lineup for BU as part of a team suspension. College Hockey News was the first to report this story. 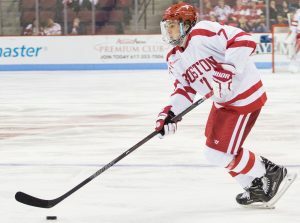 BU released a statement saying, “Beyond confirming that Mr. Roberto will not play for the Boston University hockey team this season, federal privacy laws prevent us from discussing his status. “In a 122-count indictment handed down after a year-long investigation, 33 people were indicted by a grand jury as part of the operation, which was based out of Boston and the South Shore. One of those was Keith O’Connell, who, sources indicate, is the same Keith O’Connell that is a former defenseman at Boston College and Massachusetts. She could not be reached for immediate comment when The Daily Free Press tried. It wasn’t a win, but it got the job done. The No. 2/3 Boston University men’s hockey team tied, 2-2, with the University of Notre Dame on Friday night at Agganis Arena. With the point in hand, the Terriers (19-5-5, 13-3-3 Hockey East) clinched a share of the Hockey East title and gained a first-round bye in the conference playoffs. Sophomore forward Nick Roberto scored halfway through the second to tie the score at one, and senior assistant captain Evan Rodrigues netted his 14th goal of the year early in the third to give BU its first lead of the evening. However, on the strength of a late goal, the Fighting Irish (13-15-5, 8-6-5 Hockey East) forced overtime and eventually a draw. When you have five underclassmen manning the blue line, there might the be expectation that there will be a lapse at some point in the game. But for the most part of the season, this young group has risen to the occasion. That didn’t change Friday night. Just looking at the numbers, it’s fair to say the defense kept BU in the game from start to finish. The blue liners kept the Fighting Irish outside of prime real estate and forced outside shots. By the time the game ended, Notre Dame finished with 19 shots on goal, the second-fewest BU has allowed in a single game this season. 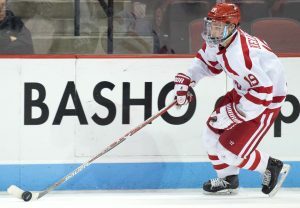 What stood out most for BU head coach David Quinn was the play of freshman defenseman Brandon Hickey. The first-year defenseman again showed his prowess with the stick and body. We’ve seen some highlight-reel goals this season, mainly from BU’s top line, but when it came down to it tonight, it was plays in the gritty areas that got the Terriers on the board. Down a goal in the second, freshman center Jack Eichel pushed through near the crease, jamming at a few chances in front of netminder Cal Peterson. Not before long, Roberto came down through the left side of the crease and gave a whack at a loose puck. On a second attempt on the backhand, Roberto drove home just his third goal of the year. Thirty-one seconds into the third, Rodrigues got his own chance at a second opportunity. Junior winger Danny O’Regan failed to put his shot past Peterson, but a trailing Rodrigues deposited the puck into the the twine. Roberto had his name appear on the scoresheet, although his linemates didn’t play all that bad either. Centered by junior Mike Moran and flanked by freshman wing Chase Phelps, the unit hemmed the puck in deep and created some turnovers with a good forecheck. 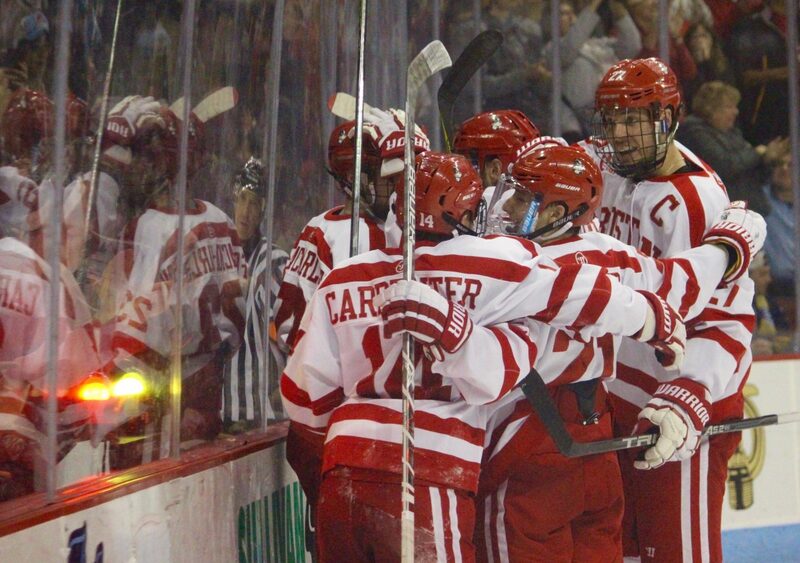 The line had six shots combined for the night — double the total BU’s first line had. Moran and Phelps had a few good chances in the first period, but Peterson stood tall. Kudos to this trio. The three of them don’t get the most ice time by a long shot, but they played well when given the chance. With four minutes and 43 seconds to go, the Terriers held a 2-1 lead that appeared pretty safe. The defense had held its own and didn’t give Notre Dame many chances. It wouldn’t have been much longer until the Fighting Irish would most likely look to pull Peterson for an extra attacker. Sole possession of Hockey East appeared imminent. But what looked as a benign rush ended up as a game-changer. Freshman Anders Bjork skated the puck through the slot, wristing the puck toward junior goaltender Matt O’Connor. The shot beat him clean, and instead of celebrating with a trophy, the Terriers settled for a tie and share, at least for the night, of the Hockey East Crown. The ceremony will have to wait another night. It wasn’t like the Terriers didn’t have chances two points Friday night. BU garnered 36 shots on goal, yet also had chances that either missed the net entirely or were blocked. 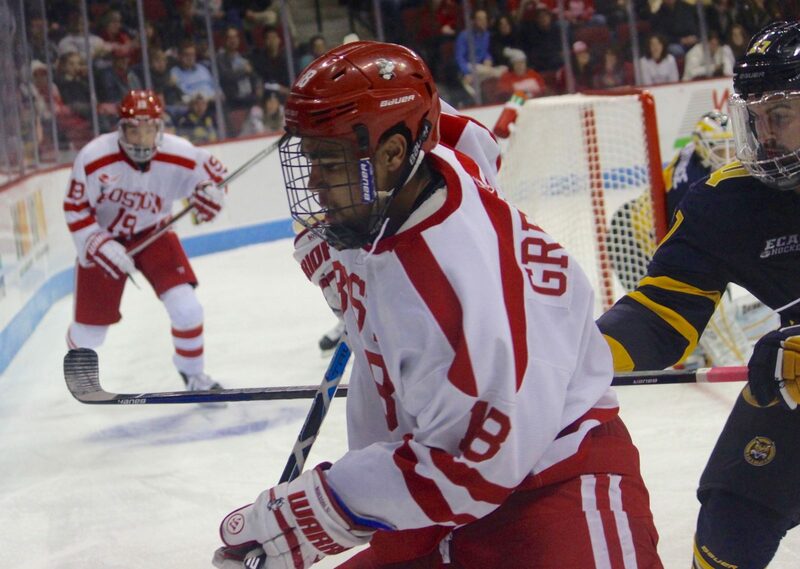 The clock dwindled in the third period and BU looked to break the tie. Junior captain Matt Grzelcyk fired a shot from the point that careened perfectly for O’Regan to tap in. Instead, he couldn’t get a clean handle of the puck and shot it a mile high of net. BU’s power play, which has been a strength of this team, also failed to come through, going 0-for-3. Playing a man up in the third, the Terriers recorded only one shot on the advantage and had trouble entering the zone. 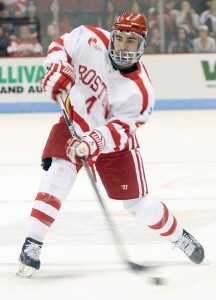 Sophomore Nick Roberto scored his first goal of the season in BU’s 5-2 win over UConn on Saturday. HARTFORD, Connecticut — A quick turnover from Friday night’s game against the University of Maine was not enough to hinder the No. 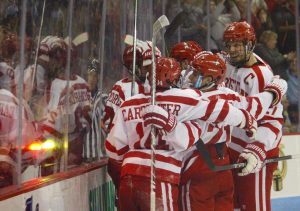 2/3 Boston University men’s hockey team on Saturday afternoon versus the University of Connecticut. The Terriers (8-1-1, 6-1-1 Hockey East) jumped out to a 1-0 lead within the first 10 minutes of the first and extended the advantage to a three-goal margin by the beginning of the third period. UConn (3-6-4, 2-3-1 Hockey East) got back in the game with two tallies in the middle of the final frame, but BU hung on for a 5-2 win at the XL Center. The BU power play started Friday night 0-for-3 before freshman forward Jack Eichel won the game in overtime with a goal on BU’s fourth chance. Building off some of that momentum, the Terriers scored their first two goals against UConn with an extra attacker. 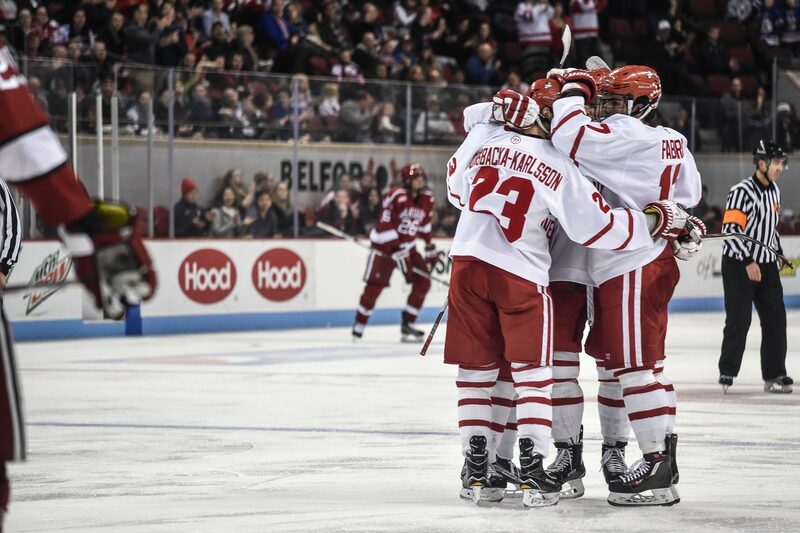 Junior forward Ahti Oksanen one-timed BU’s initial goal at the 7:28 mark in the opening period, and senior assistant captain Cason Hohmann redirected a point shot from freshman defenseman Brandon Hickey past goaltender Rob Nichols. For more on BU’s power-play success, check out Conor’s sidebar. Yes, BU’s top line totaled three of the team’s goals, but the win did not come without a different cast of characters contributing. About 2:30 into the final period, freshman forward Chase Phelps jumped on the ice as fellow freshman forward A.J. Greer skated back to the bench. Phelps took a pass from junior center Matt Lane, skated through the slot and patiently waited for a chance. As he got close to the goal, he fired off a wrister. Sophomore forward Nick Roberto was in the right place at the right time and deflected the puck into the net for the Terriers’ third goal. The tally gave Phelps his first career point at the collegiate level and Roberto his first goal of the season. 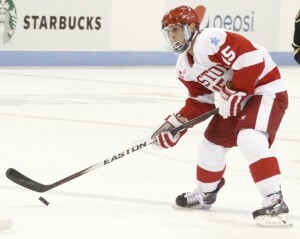 Although his name did not appear on the scoresheet, redshirt junior forward J.D. Carrabino made his first appearance in the scarlet and white since transferring to Commonwealth Avenue last year. He did not have a ton of ice time, but Quinn said the 6-foot-6 forward made his presence felt. When freshman Corey Ronan put the Huskies within one goal at the 8:46 mark in the third period, a crowd of 7,712 that was silent for most of the contest erupted as UConn scored its second goal in 57 seconds. Quinn then used his one timeout in attempt calm his team down after a poor minute of play. Whether the timeout that was the reason or not, the Terriers answered back. 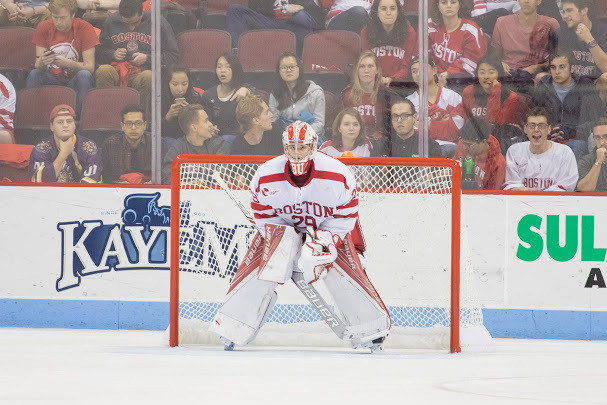 Junior goaltender Matt O’Connor made a few key stops on chances low in the slot to keep the Terriers in the lead after the stoppage. The netminder and his defense hung on long enough for the Terriers to get the fourth goal, which all but clinched the game. Oksanen banked a pass of the glass near the penalty box and set up Eichel near the blue line. As the freshman has done time and time again, he took the puck, skated into the offensive zone with speed and created his own chance. Nichols robbed him with a sprawling pad save, but junior winger Danny O’Regan was there to pick up the loose change at the 17:16 mark, scoring his seventh goal of the year. Roberto’s goal at the beginning of the third gave the Terriers a comfortable three-goal lead and put BU seemingly in command. UConn, however, fought back in a hurry. In a short span, forward Cody Sharib knocked in a rebound and Ronan wristed a shot from the left circle, beating O’Connor glove side. The breakdown gave the Huskies life and a chance to tie up the score. UConn couldn’t get that third goal, but the chances were there. Quinn’s aforementioned timeout was a key in making sure the tide was steadied. A special teams unit that worked off four power-plays a night ago had to kill just as many against the Huskies. Right off the bat in the first period, freshman defenseman John MacLeod took a boarding penalty, one of his three on the afternoon. His three penalties now give him eight for the year, which is tied for the team lead with freshman forward Nikolas Olsson. By the end of the contest, Hickey skated along with junior captain Matt Grzelcyk on the top defensive pairing during most shifts. The penalty kill did work off all eight power plays this weekend, but going forward, staying out of the box is something the Terriers need to improve upon.